Capt. 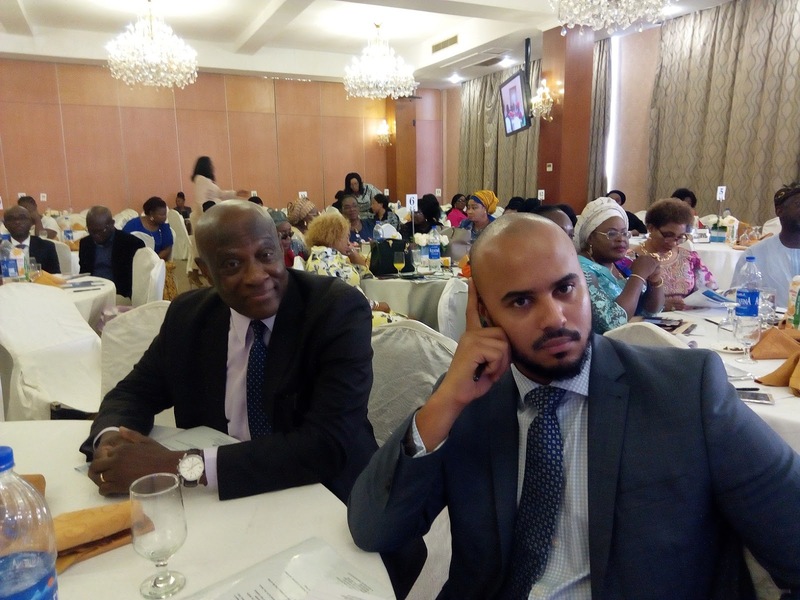 Emmanuel Iheanacho, Chairman Genesis Worldwide Shipping, and his son Uche at the WISTA Nigeria 2018 Business Luncheon in Lagos recently. Capt. Emmanuel Iheanacho, an indigenous Ship-owner and Chairman of Genesis Worldwide Shipping and other business concerns in the oil and gas industry, talks on how the opportunities to participle in shipping are determined by the structure of the nation’s trade and what it takes to address the challenges therein. In this interview that took place on the sidelines of the Business Luncheon recently organized by the Women’s International Shipping and Trading Association (WISTA) Nigeria, which focused on issues of opportunities for seafarers in Nigeria, Iheanacho said it was only natural to state that opportunities for seafarers depended on opportunities for vessels to participate in trade. He also gave his views on how best the government could handle the disbursement of the Cabotage Vessel Financing Fund(CVFF) for the development of the shipping sub-sector. What was Nigeria losing without the cargo sharing formula implementation? It was absolutely impossible to share cargo on the basis that is not related to the quality of service that the carrier was offering. In those days, Third World Nations wanted the thing to be shared on a political basis and Western Countries wanted it to be shared on the basis of the capacity that you brought to the assignments. So, it just didn’t work because there was the United Nations Conference on Trade and Development formula known as the UNCTAD 40-40-20, but the Europeans then had an exception, which was the exception that if you had an agreement with the carrier, that you will carry 100 per cent, and that was what was going to happen. So, they proceeded on that basis and the 40-40-20 is history, long time history. How has that impacted on the shipping industry in Nigeria? It didn’t impact positively when it was in force, so when it is not in force, it didn’t impact. So, what we need to do if we want to participate in the shipping, is, look at the structure of our trade. That is what determines the types of ships that you have. Look at the market structure and key elements that determine performance and profitability in the market and deal with those issues. What about opportunities for seafarers? Yes, opportunities for seafarers arise from the opportunity to participate in the trade. Shipping is part of international trade. So, if you didn’t have trade, you don’t have ships. Demand for shipping is a derived demand from what the trade wants. So, we are talking opportunities in shipping, we are talking opportunities in trade, our people have to understand the full gamut of the value proposition; from raw material, transit through the ports, carriage onboard ships, transport. They must understand this. I have said that people have to make a distinction between a training vessel and a trading vessel. The training vessel is used for navigational runs. So, if the training vessel was based in Lagos you would run out and you do navigational exercises and you come back the following day. It doesn’t count as sea time. What counts as sea time is the time that you have on a trading vessel. And the trading vessel you talk of relevance, is not a coastal one. It is the international trading one. You have the same size ships and it is doing only coastal runs, it will be about only one-third of the time. So, if you did 30 days they count only 10 days for you. How can the issue of CVFF disbursement be addressed? They should set a criteria and disburse it to people who have the capacity. There are so many things I could do for them, it is to ask them to continue to use people who have experience. With the explanations that I gave there, you will now better understand it; you won’t put the cart before the horse. You won’t go and train people and when they come back you say ha! where am I going to train them for sea-time? You would have made complete arrangements, when they finish from school you look at where they go. After they finish, look at when they start paying back money. You would have done all of those things. Capt. Iheanacho sees the engineering of change in policies and attitudes as factors that could help establish the desired position for indigenous participation to add value to the nation’s export trade.